Applied Analytics’ online gas analyser. 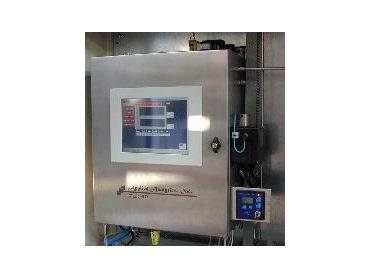 THE measurement of gas in process and waste streams is of great significance to many industries. The new range of online analysers by Applied Analytics are able to provide both high accuracy and fast response for a number of different gases as either single or multiple component analysers. * Ex’p’ rated cabinets for use in hazardous areas. One of the unique design features of the analysers is a solid state diode array spectrophotometer for detection. This spectrophotometer measures the complete spectrum from 190nm to 1100nm, with 1nm resolution allowing for a very wide concentration dynamic range and accurate measurements. A UV/VIS 1024 diode array detector is included with the analyser. The photodiode array has a broad spectral response and high sensitivity in the ultraviolet range. The low dark current and large charge saturation enables signals to be obtained with a high signal to noise ratio. The detector's aperture match the fibre optics numerical aperture, thus maximising the light throughput. Either a very long life pulsed xenon lamp or a low noise Deuterium lamp is included with the analyzer. The light is focused onto the tip of a fibre optics via collection optics for maximum light throughput. The product’s absorbance spectra measures a complete spectrum of the process and analyses the data via a calibration method to give very accurate and reliable concentration readings. In continuous operation the complete spectrum is displayed, which allows the operator to check the system and the validity of the actual reading - as opposed to filter based units where the operator has no access to the actual detection’s final numbers. The sample is brought to the analyser in a number of ways depending on the accuracy required and certain physical parameters unique to each installation. * In-situ probe for direct in pipe mounting (300°C and 200bar).